OFFHAND, I salute the Bicol Autonomy Movement for raising the discussion on federalism to another level. The proposed charter for a Bicol Autonomous Region (BAR) finally provides a clear starting point for a meaningful conversation on the issue, which is a sentimental one for Bikolanos. This is certainly far more important than the ongoing furious inane air war between Dato Arroyo and LRay Villafuerte over the Libmanan-Cabusao Dam Project that has become very irritating and proves only one thing: they both have oodles and oddles of money whose questionable provenance, given their meager salaries as public officials, is what local radio stations should be investigating. But you can't expect local radio stations, whose management are laughing their way to the bank, to care a whit, can you? The faster the burn rate, the better for them. Anyway, the establishment of a regional government akin to the one in the Autonomous Region for Muslim Mindanao (ARMM) is a concrete step towards this aspiration -- which clearly does not need tinkering with the 1987 Constitution. But one nagging question that must be answered: can the BAR fly for the long haul? Or stated differently, will it be able to sustain itself? I have strong reservations that it will. Article XI (Fiscal Autonomy) consists of nine sections that essentially lay down the mechanics as to how the proposed BAR regional government will fund itself. Section 1 provides that it will retain 80% of all national revenue taxes imposed, as well as the income derived from utilization of national resources in the BAR. Section 4 identifies the main sources of revenue for the regional government, including the imposition of its own taxes, national transfers, share in both tax and non-tax revenues collection in the BAR, block grants and other forms of donations, aid or endowments. Section 5 defines the sharing scheme for the 80% share of national revenue taxes to be retained between the BAR (which will get half of the 80% or a 40% net) and its component local governments (provinces, cities, municipalities and barangays, which will share among themselves the remaining 40%). In addition, Article XIX (Transitory Provisions) also provide two additional interim funding source: a P25 million initial outlay to support the operations of the interim regional government (Sec. 4), and P10 billion annual outlay for priority infrastructure projects over its first five years of existence (Sec. 13). But totaling all of the above, as summarized in the accompanying chart, shows that the region will be worse off by at least P5 billion annually under the proposed BAR than under the current setup during those first five years. 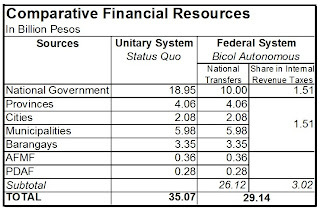 For one, DBM data here show that in the current 2009 budget, Bicol already gets a total funding allocation of P35 billion, spread throughout the regional offices of national government agencies, the local governments (mainly their IRA share), as well as the pork barrel of its legislators and its share in the Agriculture and Fisheries Modernization Fund. Of the total, almost P19 billion are allocated for the regional offices of various line and staff departments of the national government, which in theory is what will be devolved to the proposed regional government; DepEd accounts for almost P11 billion of this, which effectively is the cost for providing basic public education services in the region. The proposed charter failed to fully factor in the cost of these devolved services. Can the BAR cover this huge funding shortfall by getting half of the 80% of internal revenue taxes that will be retained in Bicol, as Section 1 of Article XI proposes? Hardly. The 2007 report of BIR collections show that Bicol contributes only 0.53% of the country's internal revenue taxes. Using this data, this translates to a share of only P1.5 billion for the BAR regional government. And because the P10 billion outlay for insfrastructure is a special purpose fund that cannot be used to defray to cost of other essential services defined under Section 2 of Article VI, we are looking at a gaping funding shortfall of at least P17.5 billion annually. Will the BAR's proposed taxing powers and other revenue sources make up for it? The huge difficulties being faced by the national government's revenue agencies, mainly the BIR and Customs, in plugging this year's deficit -- projected to hit P320 billion -- does not inspire confidence. It is stuff like these -- financing and institutional arrangements that will help make sure that the proposed Bicol autonomous region will be sustainable over the long run -- that needs to be examined and reexamined, both by proponents and critics of the BAR. As things stand, a federal Philippines will never be able to fly if no equalizing mechanisms will be adopted, in the face of current realities where the National Capital Region accounts for 87% of the internal revenues of the national government. Clearly, one cannot treat unequals equally. There are other considerations that matter as well (for instance, are provincial governments a redundancy under a system of regional autonomy, or not? ), and I will try to cover them later. But certainly, the Bikol Autonomy Movement does need to review the provisions of its draft charter in regard to the sustainable financing for the proposed BAR.